Installing the required software on the server. Selecting which repositories to mirror on the server. Once apt-mirror is installed we can make a backup copy of its configuration file /etc/apt/mirror.list, after that you make sure the line containing the option set base_path points to the correct path for our repository (by default is /var/spool/apt-mirror ). Mirroring the selected repositories locally on the server. Configuring automatic sync process by using cron scheduler. Configuring the local repository list. 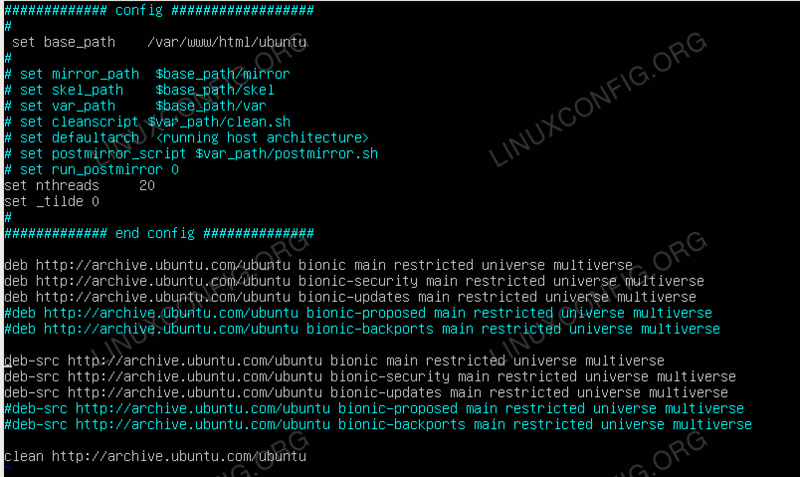 It is recommended to comment any line in the /etc/apt/sources.list file referring to repositories not mirrored in our server, for instance, in this case, any line starting with deb-src and containing bionic-backports have been commented. If you don't do that you might get the error Release file has not been found when running the command apt update on the client.